Patients usually don't see what goes on behind the scenes: the pathologists who scrutinize tissue to determine if it's cancerous; the medical dosimetrists who plot the paths of radiation beams so they hit the cancer and not the healthy tissue; the pharmacy technicians who mix precise doses of medicines for each individualized prescription. 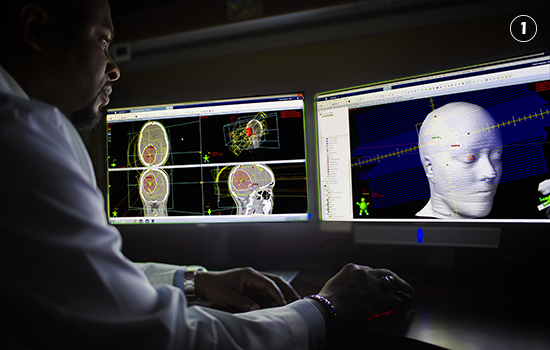 Weeks before Brooke Gallivan started radiation treatments for a brain tumor, Winship medical dosimetrist (from the word "dose") Oluwatosin Kayode went to work mapping the path for the radiation waves to take (1). Starting with the prescription from radiation oncologist Hui-Kuo Shu, Kayode generated a 3-D computer model using Gallivan's CT scans. Determining the best, safest dose of radiation therapy is a balancing act between delivering enough radiation to shrink or control the tumor, without damaging normal tissue and vital areas like optic nerves and the brain stem. The dosimetrist painstakingly maps out a patient's individualized plan and then works with the radiation oncologist to check and perfect it. For a brain tumor patient like Gallivan, a mask (2) is created to keep her head immobilized in the right position. When treatment begins, radiation therapist Shereen McLendon (3) positions Gallivan on the table with her mask and monitors the radiation (4). Although radiation treatments last only a few minutes, hours of preparation go into them. Dosimetrist Kayode says it's extremely gratifying to perform this vital step in a patient's treatment. SCENE 2: Is it cancer? Fred Erler faced the possibility that the nodule seen in his lung imaging could be cancer. A needle biopsy might indicate cancer, or it might be inconclusive. So Winship thoracic oncology surgeon Seth Force offered an alternative: minimally invasive surgery (1) to remove the nodule and take it immediately into the pathology lab to be tested (2), while the patient was still under sedation in the operating room. If it was cancerous, Force could go back and remove the entire lobe of the lung. If it wasn't cancerous, surgery would be over and Erler would go home the following day. Locating a lung nodule during surgery can be difficult because our lungs are constantly moving as we breathe and, in this case, the nodule can be very small and not directly visible during surgery. So a tiny marker, called a fiducial (3), was inserted next to the nodule that helped Force locate and remove it quickly. Working against the clock, pathologist Gabriel Sica and his team had 20 minutes to prepare the nodule for testing and make a determination: not cancer. (4 and 5) Fred Erler was done with surgery and Force could tell his family the good news. "Once he's recovered, he will not need more follow-up," said Force. "He doesn't have to live with the uncertainty of having cancer." 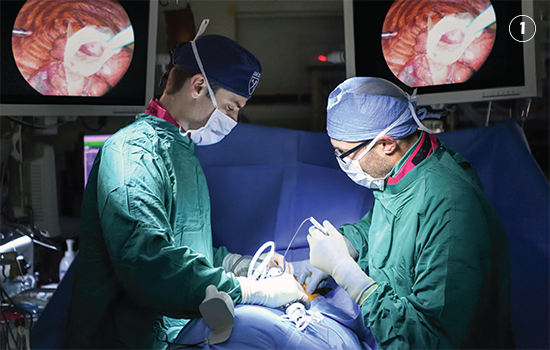 Pathologist Gabriel Sica and thoracic surgeon Seth Force explain the benefits of testing the patient’s nodule during surgery. It's not uncommon for cancer patients to receive three or more different medicines as part of their treatment regimens, and dosages can vary on every visit. 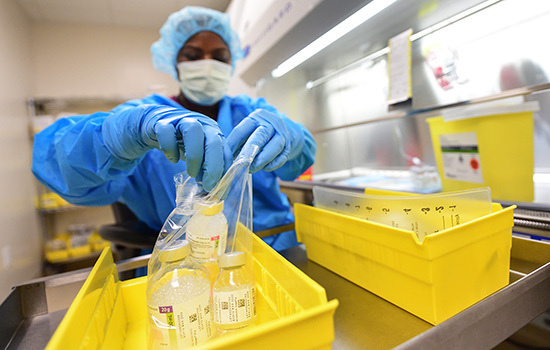 Winship patients get treatment at multiple infusion centers throughout the Emory Healthcare hospital system but what they all have in common is strict attention to precision and extreme care in keeping the medicines from being contaminated. 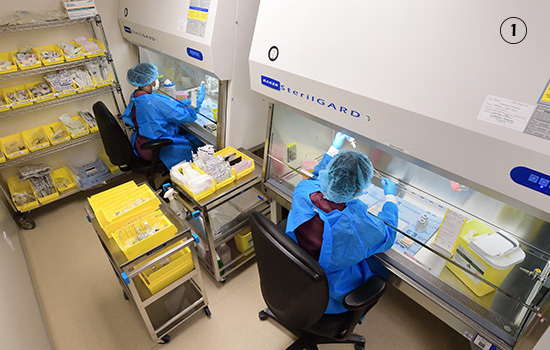 This new, state-of-the-art pharmacy in the ambulatory infusion center at Emory University Hospital Midtown provides a sterile chemo room for two pharmacy technicians to work side by side, making up individualized prescriptions for the patients being treated that day. Pictured are Pearline Ledbetter and Candy McBride, pharmacy technicians level 3, in the chemo room (1), while breast cancer patient Pauline Echols waits in the infusion center (2).